Stewart D’Arrietta’s acclaimed off-Broadway hit 'Belly of A Drunken Piano' comes to Melbourne for 2 shows only. 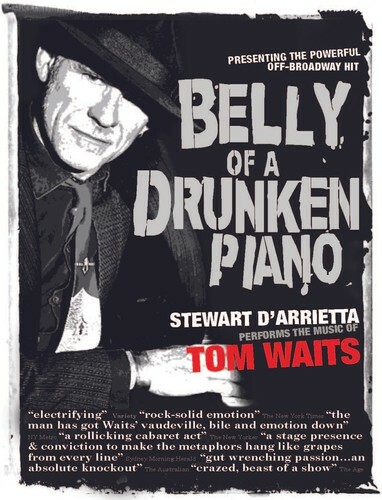 Described as ‘electrifying’ by Variety, ‘rollicking’ by The New Yorker, and with ‘rock solid emotion’ by The New York Times, 'Belly of A Drunken Piano' is a passionate, demented and intense rock journey through Tom Waits’ rich catalogue of music, mining some of Waits’ most memorable hits—from Martha and The Piano Has Been Drinking to Big in Japan and Hold On. Waits’ colourful misfits come to life in this powerful, poignant and innovative show. Touching on the themes of love, loneliness, war, the dreams and ambitions of childhood and our relationship with God, D’Arrietta romps through the songs with his trademark raw vocal style, punctuated by his laconic humour. Making it’s off-Broadway debut in 2005 at The SoHo Playhouse, D’Arrietta has performed his sell-out show at The Edinburgh Fringe (2007), Montreal Jazz Festival and London Riverside Studios (2008), and most recently at the 2018 Adelaide Fringe Festival, where it collected all 5 star reviews. MEMO is the only place in Melbourne you can catch D’Arrietta’s world-class production, so don’t miss out!